We use Google daily. When we need to know something quick, it’s the first resource we think of. Have you ever wondered how Google determines what information and which sites to present to you first? Often, we supply even the vaguest of terms and still receive detailed and helpful search results that get us the answers or information we want. So how does Google do it? Algorithms. These algorithms search for key components or material from web pages and organizes them into relevant search results. For many new or smaller businesses, hacking these algorithms can be a bit difficult. The easiest place to start is through Search Engine Optimization (SEO). SEO is an organic way to give your brand the boost it needs and to refine your search result placement. Images are a great way to keep your audience interested. Approximately 65% of individuals are visual learners, meaning they search for visuals or remember things best from visual representations. This is your chance to appeal to both audiences. Make sure that your image is relevant to your company and the page it’s on. The size of the images you use can also make or break user interaction with your site. Larger images don’t only take away from the meat and potatoes of your site, but they also take longer to load. Always remember the 8-second rule: if your site takes longer than 8 seconds to load, 50% or more of visitors will leave. Another essential to differentiating your page amongst others is the use of keywords. This one might sound simple but take this into consideration. Is what your sharing revolutionary? Have others already discussed the topic? Most likely, yes. Find a way to tie keywords together in a way that connects similar topics or take advantage of new hot topics. If you’re one of the first to share insight on a new topic, you’ll have a competitive advantage over others late to the trend. With over 2.5 billion people in the world owning a smartphone, mobile web pages have become increasingly relevant. If your website isn’t mobile friendly, a good majority of your audience may turn away and search for another site that is. Most website building platforms allow you to toggle between both and offer simple and easy to use layouts that make it easy for people to find what they’re looking for. Always make sure that your website performs well on a mobile device, and that everything formats correctly. If it’s all out of order and scattered, you risk losing all connections with your mobile audience. If you follow these three tips, you’ll have a head start in optimizing your search engine results. Though there are more helpful tricks and benefits that SEO can have to your web page, starting here will help you establish your brand and increase your engagement. At Traffic Jams, we specialize in web design, SEO, social media and content creation. 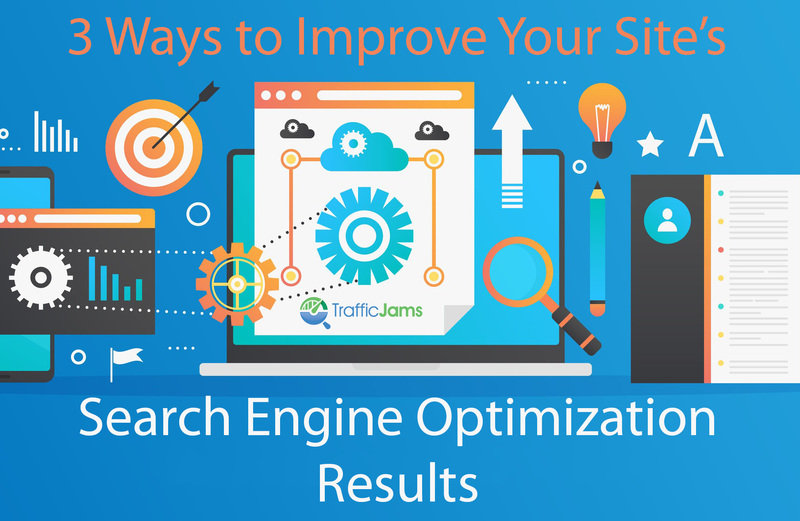 If you’re searching for more ways to improve your SEO performance and increase your visitor’s engagement, give us a call at (855) 859-9998 or email us at sales@trafficjams.com.